I Don't See How You Could Improve Your Services!! The service of Bryson Law Firm was upfront and to the point! They communicated with us regularly and explained the tax resolution process to us. I don't how you could improve your services!! Your Firm is BETTER Than "Better"
I chose Bryson Law Firm because you are a local, Louisiana firm. After talking with Mr. Bryson, my mind was put at ease and I quit worrying. I was always able to call any time I had a question and your staff made me feel like part of the family!! I am already telling all my family and friends about Bryson Law Firm. Your firm is BETTER than "better." Thanks a million for solving my IRS problem! Again and Again, I Say Thank You! I am so thankful to the Bryson Law Firm for all that you have done for me. It is such a great feeling to know that the situation with the IRS is over! Of course, all of the credit goes to all of you. I will forever be grateful. Again and again I say thank you! The Bryson Law Firm brochure has a lot of very good information, and was the initial reason we chose Bryson Law Firm to help us with our tax problem. During our first consultation with Cary Bryson, he told us exactly what we needed to know; he never brought up fees and the consultation was free! The one thing that really stood out about our experience was how good Cary was at explaining 'how the system worked' - no one else ever explained it to us as clearly as he did. He seemed to understand our situation and gave us good advice – all at no cost to us. We are very satisfied customers, and we would be happy to refer our friends and family to Bryson Law Firm. Cary and Angie Bryson kept us informed along the way. 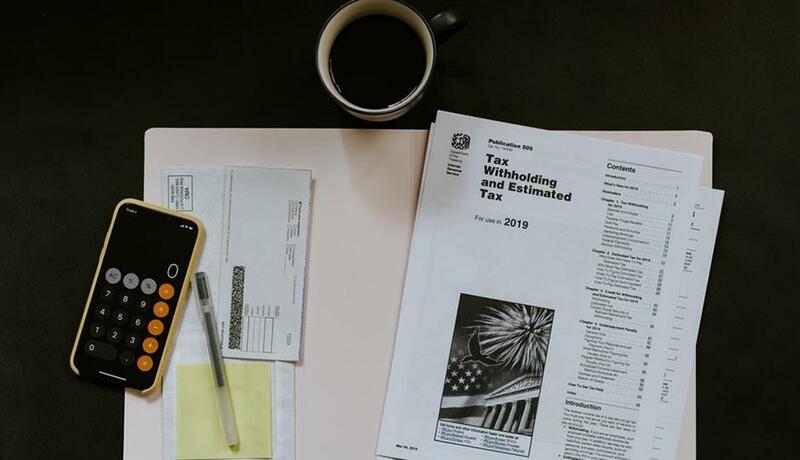 They explained the tax resolution process including the IRS conclusions and closing procedures as well as all relevant alternatives available to us. We found the Bryson Law Firm personnel to be friendly and knowledgeable. They always made themselves available to us, and my wife and I felt comfortable discussing our problems with them. The staff at Bryson Law Firm made sure to keep in contact with us throughout the whole process. On one occasion, while my wife and I were on a trip to St. Louis and Milwaukee, Susan called us on our cell phones to tell us that some forms had to be signed that very day. She faxed the forms to our hotel, so that we could sign them and get them in on time. We would recommend Bryson Law Firm to anyone. I first heard about Bryson Law Firm on the radio. The ad sounded honest, so I gave them a call and set up an appointment. They Explained Everything In A Way That Was Easy To Understand. Everyone really cared about my difficulty and wanted to help me get through it successfully. Everyone at Bryson Law Firm was really caring. They were very patient and never seemed to tire of explaining to us and answering our questions. We were very, very satisfied with their services and the outcome. I would tell anyone that has tax problems to go to Bryson law Firm because they go above and beyond to help. I lost my husband suddenly and was hurting. I was making half steps on a daily basis. Cary and Angie Bryson filled in the other half step and together we made full steps and completed the tax problem. Cary and his lovely wife, Angie explained everything to me after my husband died to the point that I felt secure and safe in the decision being made. The one thing that stood out was that they really cared about me personally and made me feel like I was not just a client. Cary and Angie became people that I prayed for and I know that these two lovely people and their whole firm prayed for me. You never know who God puts in your path. When my life was falling apart, everyone at Bryson Law Firm showed me love and compassion. When my thoughts were not my own, I knew that they were taking care of my tax problem for me. I never felt that it was all about the fees for Bryson Law Firm – instead it was all about helping us. They communicated with me on a regular basis – I felt reassured. They explained everything beforehand and it was very clear-cut information. 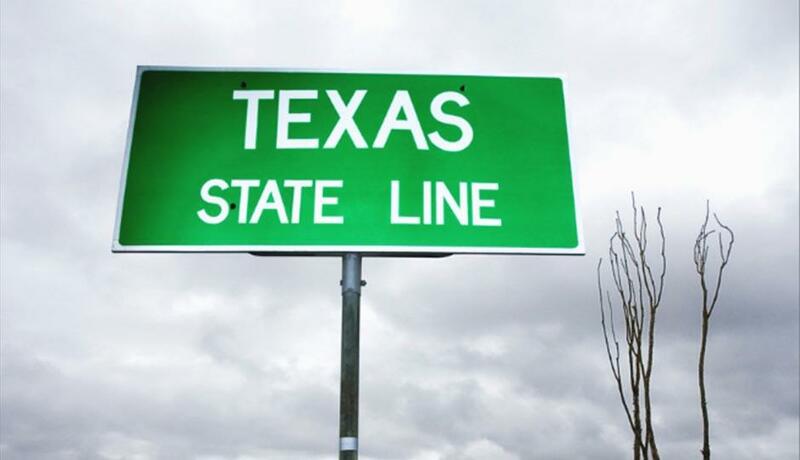 Compared to the previous experience with another firm in Houston – it was like day and night. I felt Bryson Law Firm handled everything and gave us confidence that we were not going through it alone. Bryson Law Firm is an honest, family oriented office. Whenever I called, the whole staff knew about my case. I never felt like just another "number." Cary Bryson made me feel confident that things would be resolved. He got the IRS off my back so that I could get on with my life. I hope I never have a problem like this again, but I would definitely come back to Bryson Law Firm. Bryson Law Firm settled a serious problem in my life and now a great weight has been lifted from my shoulders! The call back response time was wonderful. I never felt like I was forgotten nor a bother. I would definitely tell my friends and family about Bryson Law Firm. A Special Thank You To All Of Bryson Law Firm. Thank you so much for making us your client of the month and sending us that much appreciated gift card. Everyone is always helpful and always willing to go the extra mile for us. I not only feel like a client, but a great friend to a bunch of great people. Thank you for making me feel special! Thanks to all of you for your help and hospitality! I feel as though a dump truck has finally been driven off of my chest! You have my business and referrals as long as I am a resident of Louisiana. We would like to thank the Bryson Law Firm and staff for their expertise, diligence, time, honesty, and trust on what they accomplished for us with the IRS. We will recommend this Law Firm of Bryson to all people we come in contact with regarding legal council for them, or their family or friends. This experience has been fruitful, not only in what was the end result, it was with tremendous effort which was shown by this staff of genuine and concerned people of a job well done. My wife and I want to thank you from our hearts for what you have done! I have to tell you, I felt soooo much better after leaving your office last week. I have not felt confident that my tax problems were going to be taken care of properly for the past 5 years. 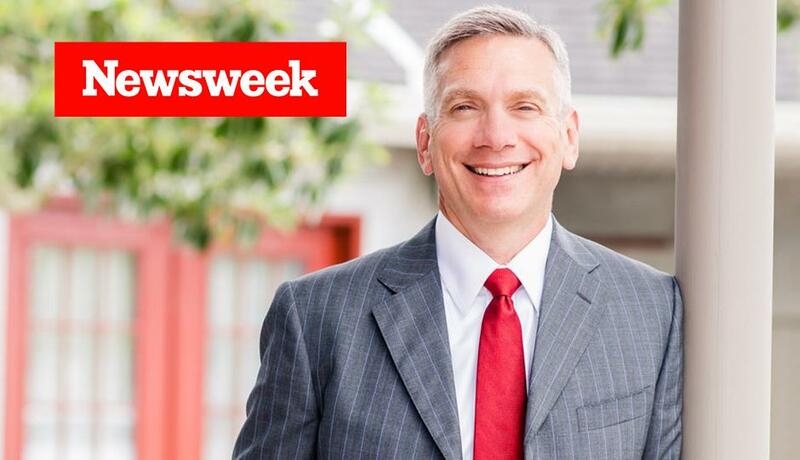 Cary is a great attorney and person. Thank you for continuing to badger me with your promotional letters. I chose Bryson Law Firm, LLC to help me with my tax problems because I needed an attorney that was familiar with the IRS. They were very knowledgeable and explained everything to me that I needed to better help me understand. Cary was very courteous and friendly. I will tell my family and friends that Bryson Law Firm is an outstanding company and I recommend anyone to go to them. You Did An Outstanding Job! Thanks A lot. Before contacting Bryson Law Firm we felt doomed... like it was too late to get a clean slate with the IRS. Angie followed through with everything she said she would do and before we knew it the total tax debt over three tax years was reduced from approximately $45,000.00 down to $22,000.00. They really wanted to see us happy again over and above wanting our money for their services like most law firms. We chose Bryson Law Firm because we felt that they were sincere and honest. They were very helpful in getting our lives back on track without worries. They get the job done. We would recommend them to anyone with tax problems! I have nothing but good things to say about the Bryson Law Firm! Bryson Law Firm helped me accomplish something I never thought could be fixed. You were tough with me but it was exactly what I needed to get through this! You and your staff were very helpful as far as keeping me on track with everything I needed to do to make this possible. I found out about Bryson Law Firm through a letter in the mail and thought to myself, this is my last chance to make things right with the IRS and I was right! I had other offers to fix my tax problem but when I found out that you were a local firm, close to home, I felt more comfortable with that instead of calling an 800 # dealing with strangers. And when I met you guys, I felt more confident in my decision! You were kind, concerned, easy to understand and very helpful! Because of Cary & Angela I can continue living without worrying about my tax problems which could've ruined my life and start fresh and become a loyal tax paying citizen again like I was in the past! Thanks again to The Bryson Law Firm"! I will keep referring people to you as long as I live! I had reached 'the end"! 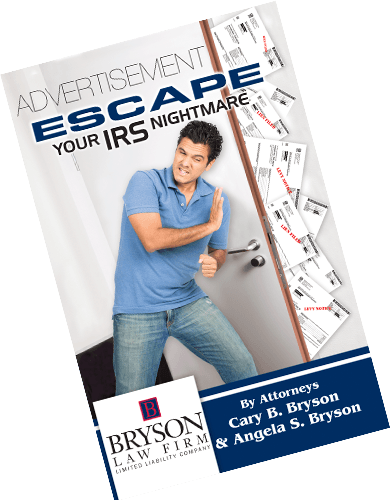 with the IRS and remembered the DVD I had received and decided to try Bryson Law Firm before declaring bankruptcy. They are local Â– not one of those national rip-off outfits (like J.K. Harris)! They are very knowledgeable and helpful. I felt relieved and that I could trust Mr. Bryson even after the first meeting. A plan was in place only after a few days! The speed of action and the immediate contact with the local IRS office was incredible! Cary made me feel like I was cared about and he gave me a REAL sense that he could and would help me. You did Great! The fees were not too high for the excellent job you did! Your work was a Complete Success! You really understand the IRS system and the law. I only wish I had come to your firm earlier!